Carlos Peguero had yesterday off, Justin Smoak had yesterday off and Chone Figgins had a couple days off. The result - hits, runs, and a big 'W'!!! 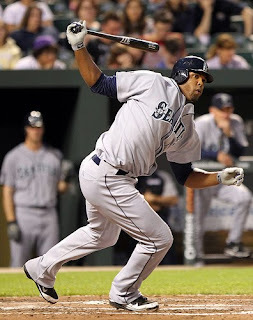 Carlos Peguero has one of the most unorthodox swings that I have ever seen, and one of the hardest swings. He reminds me of Pedro Serrano from the movie "Major League". A guy who would crush a fastball every time but couldn't hit a curve. Superstitions of praying to Jobu and keeping his bat warm, even sacrificing a chicken pre-game, or a bucket of KFC. Peguero does have an ability to strike out, but I think he is the type of player that pitchers would fear making a mistake to, and that is exactly what the Mariners need in their lineup. The offense got a kick start tonight when Justin Smoak hit an opposite field homerun in the first inning. In the bottom of the fourth the Tigers got two on an opposite field homerun from Victor Martinez. Erik Bedard pitched another great game but only made it through 5 innings of 3 hit ball. However one of those hits was the 2 run HR. The lead didn't last long as Carlos Peguero led off the top of the fifth with a triple and scored on a Gimenez single through the left side. Mariners 2, Tigers 2. The top of the seventh Carlos Peguero became the hero with a towering shot just inside the foul pole down the right field line. Talk about a moon shot, I don't think I've seen a homerun shot quite like that before. It proved to be just what the doctor ordered as the M's won by the final score of 3 - 2. Chone Figgins led off today as Ichiro was given a much needed day off. Figgy went 2 for 4 with a double, his first two hit game in forever. Hopefully he can climb out of his slumber and Ichiro after his day of rest will follow suit. If those two guys can start hitting their career averages the rest of the way out, we'll look like a whole different ball club. Speaking of following suit, the Texas Rangers won once again today. We seem to be mirroring everything they do, or vice versa. In the past week we have stayed pace at 2.5 games back every day. Angels lost again, their 6th straight and Oakland finally broke their ten game losing streak tonight. A great day for baseball in the AL West. Let's GO MARINERS!! !